Can You Get Top Dollar When You Sell in the Fall? | Orange County, CA Real Estate Video Blog with Frank Del Rio Orange County, CA Real Estate Video Blog with Frank Del Rio: Can You Get Top Dollar When You Sell in the Fall? Can You Get Top Dollar When You Sell in the Fall? During the fall and winter months, people typically decide to take their homes off the market and wait until spring to give selling another chance. In a sense, this is understandable, as there are fewer buyers out there than in the spring. What most homeowners don't know, however, is there are more quality buyers in the market at this time. There are two types of sellers out there: those who are in the market, and those who are out of it. Sellers who are “out of the market” will continue to list their homes during the fall and winter seasons but only at their desired price, which is usually outside the market’s demands. This leads to a “swell of inventory”, with only a small number of buyers who are actually in the market pricing their homes accordingly - they are the ones getting all the showings and offers. This past week, we listed and sold two separate properties, both of which had multiple offers on them, one selling at its full asking price, the other at $5,000 over its asking price. What we're getting at is this: you can meet your selling goals and get your asking price if you know how to list your home at a desirable price for the current market (we can help with that). 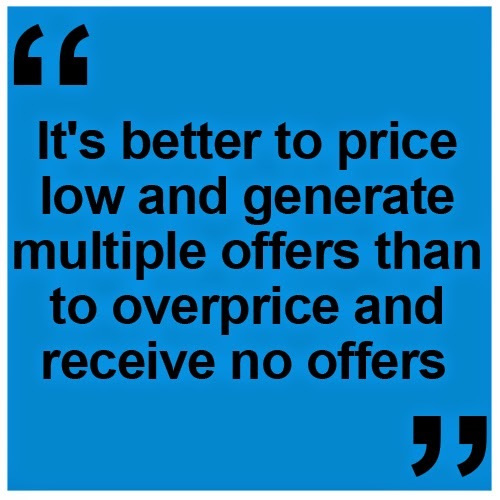 It's better to price low and generate multiple offers than to overprice and receive no offers. Other agents will tell you to list high and pray, but we know that won't work - you'll be priced out of the market and forced to make a price reduction that will net you less than if you would have priced it right from the start. There's no need to wait until the spring to sell. There's almost no competition in the market right now and you'll be able to get the price you want in this market. If you wait until spring, you'll have more sellers to compete with and you won't have as many quality buyers out there. If you're interested in taking advantage of this market, we would love to get you a market analysis and start creating a pricing strategy for your home. We hope to hear from you, and look forward to our conversation being the best of your day!